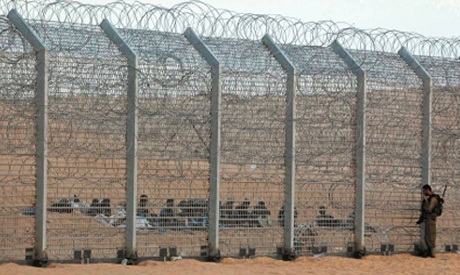 Israel said Tuesday it has finished raising the height of an electronic fence along part of its border with Egypt to shut down irregular migration routes. The 242 kilometre (250 mile) barrier, stretching from the Gaza Strip to the Israeli Red Sea resort of Eilat, was completed in 2014. The Israeli government hoped it would tackle illegal migration, drug and weapons trafficking and infiltration by "terrorists". It slashed the number of African migrants arriving in Israel, but at least 213 still managed to breach the fence in 2015, the defence ministry said. That prompted authorities to raise its height from five to eight metres (15 to 25 feet) along a 17-kilometre (10-mile) stretch, it said. That, plus additional detection devices, had "significantly curbed the flow of illegal infiltration into Israel, with only 11 successful attempts to cross the fence throughout 2016," it said. The United Nations says Israel hosts 53,000 refugees and asylum seekers including 36,000 Eritreans and 14,000 Sudanese. Most reached the country via Egypt's Sinai Peninsula. Israel rarely grants them refugee status.